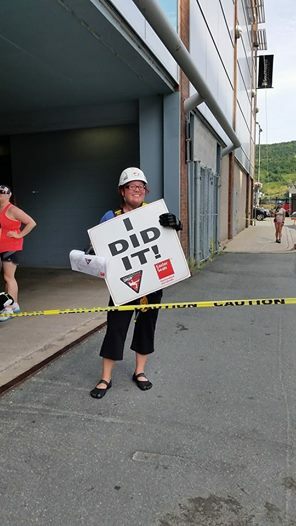 Me, after rappelling the nine stories of Atlantic Place during an Easter Seals Fundraiser. One of the last things I said to a fellow teacher was that this summer was going to be my summer. I was going to be well rested, get super healthy and get fit. I had plans, such plans. So, rested didn’t happen – my family and I have been all over the province. I’ve rappelled down a building for goodness sake! Rested didn’t really happen. Oh well, I can sleep eventually, right? Healthy and fit…. well, that started. I have to admit, there were some holidays taken where wings and pizza were on the menu – it’s a good thing the Bonavista Social Club isn’t closer to my house. However, with the use of some apps, I’ve gotten to push myself health and fitness wise and go farther than I would have imagined. You should note that I mention these apps for my samsung phone; fitbit is the same for my iPad and I am positive that Apple would have a comparable app for c25k and s health. Fitbit tracker – whoops – gotta charge it soon! A gift that I was given was a fitbit. 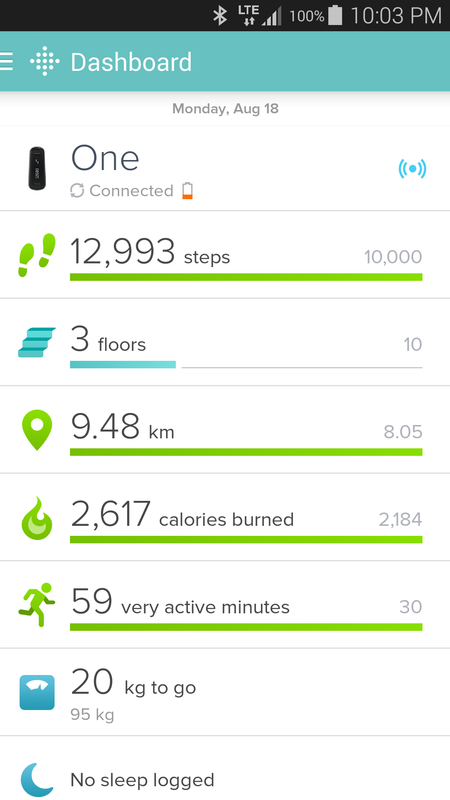 if you’ve ever wondered how much and far you walk every day, a fitbit will help you out. I have the “one”, a fitbit that can track not just my steps but my stairs, my sleep and with the app, give me a space to track water and any weight goals I have. 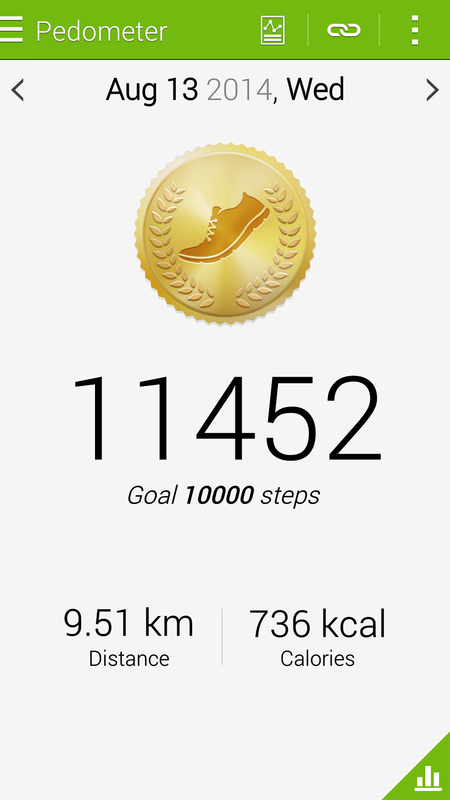 I find it fun to see how much I walk in a day – there are days that seem super active and yet I only walk 7000 steps. There are days I know are full and the fit bit at the end of the day shows that yes, I walked 14000 steps. One hike we took this summer was equal to 49 sets of stairs! The days that are lower but feel like they should be more I analyze- was there are lot of walking from sitting to sitting, was the day more active mentally and that’s why I’m tired? I not-so-secretly have the goal of doing a workout that alone reaches my goal of 10000 steps per day. However, that will come. Right now I think my record is 9000 steps during a workout. Not so shabby and I know it because of my fitbit. Yet, if you don’t want to pay the money, chances are if you have a smart phone you have a step counter and fitness encourager. My phone is a samsung galaxy and came with S Health. It’s a great step counter – and gives you encouragement as you go – but you do need to be walking with your phone. It doesn’t do as much as fitbit, but has been great for those days when I forget my fitbit at home but want to keep track of my steps. I do like hearing it triumphantly trumpet when I meet my step goals. But running. How running? I have always envied runners their ease of exercise – they look so graceful and strong running with serious faces. I have always been more of a yoga/swimmer/climber/jillian-michaels-victim. This summer I tried running. I decided that I needed a coach of some sort and most programs were not at good times – being a teacher, you don’t get to do stuff at the same times as others. In this case, I wanted to run at 8am as many mornings as possible. I was not pushing enough – I was letting myself walk more than I should. So I downloaded a Couch to 5K app. You can get any number of paid versions. I, however, choose the free version of the Zen Labs C25K. It’s fantastic – it pushes me to run longer but gives me walking time to recover. I can use a playlist of my own music in the background, while a pleasant voice tells me when to walk and run. AND, in case I don’t hear it, my phone will vibrate. I can choose whatever workout I want and when I finish it will tweet or update my facebook status for me if I wish (I have not opted to do this). You can get a paid version with no ads, but the ads don’t bug me, so I haven’t upgraded. 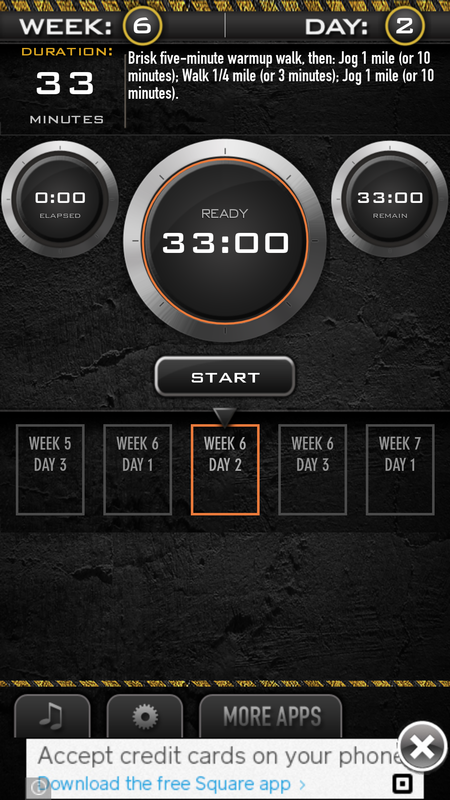 For those hoping to put some fitness into their school week, this is a great app to help push you into running. I’m still not very good – I am quite slow – but my endurance is building up and I’m thrilled by that! So, as the school year begins, I will have to find new ways to make these apps work with me. If you see me taking laps around my classroom, you’ll know why! I encourage anyone who wants to explore healthier options to check out what they can do with their phones/ipads/tech. I know that my eyes have been opened by my technologies and what they tell me! This entry was posted in Reviews and tagged apps, fitness, reviews. Bookmark the permalink.